The place was abuzz with eLearning industry peers who had come together to share best practices and learn from each other. The conference was packed with over 100 informative sessions, which provided great insights through case studies, best practices sharing and discussions around new developments in the eLearning domain. Our Raptivity team was all set to welcome conference attendees and provide them with product details and demo at the booth. Many visitors to our booth were aware of Raptivity because of our continued presence at this conference. As always, it was great to connect with some of our customers! They had stories and experiences to share about how Raptivity is helping them add interactivities to their courses. Others who were introduced to Raptivity for the first time were super excited about being able to augment their learning content with interactivity, and commented that they couldn’t wait to go back and try it out! The level of excitement and appreciation shown by our customers and others gives us motivation to continue innovating and coming up with new features and product enhancements. I attended a few sessions that were quite engaging and informative. They threw light on some of the key topics (Interactivity, mLearning, offline learning, xAPI, etc.) that are being widely used today in the eLearning industry. As for the latest buzz on Raptivity, without a doubt it was Engagement Analytics! 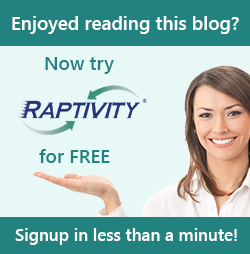 Raptivity recently launched Engagement Analytics. There were quite a few people who were interested in knowing more about how Raptivity interactions can now be tracked using analytics, and were excited about its future potential. Overall we had a great experience connecting with industry peers and customers. 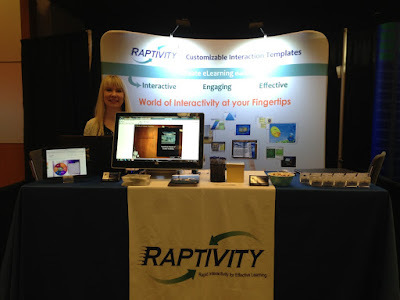 Raptivity is certainly looking to exhibit at the Learning Solutions Conference next year. If you didn’t get a chance to attend the conference and see Raptivity first hand, you can check out some amazing samples on our website and even try out Raptivity’s collection of 190+ interaction templates. Start your 14 day free trial now!